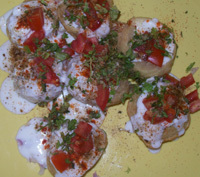 Dahi puri (also spelt as Dahi Poori)is a popular Indian Chaat item. 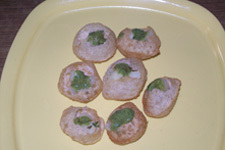 It is basically an Indian street food like pani puri. But restaurants serve it too. It is a curd (dahi - plain yogurt) based item so it is very satisfying to end your street food meal with a cool dish such as dahi poori. As with pani puri, you can make the preparation for dahi-puri in advance and assemble the dish when you are ready to serve. Follow the steps given below to assemble the final dish. It is a popular party dish. 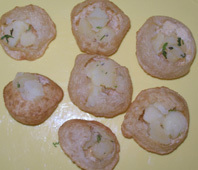 Be it a kids party or an elder's party, dahi poori and pani puri are in demand. Keep all the ingredients ready before you start assembling the final dish. Small puris - 10-12 or as many needed. onion - 1/2 cup finely chopped. Follow the instructions and the images given below. Place 5-6 puris on a plate. Tap each puri on the thinner side to make a hole. You can also use a back of a spoon to make a hole. Add a little (about one tea spoon) of potato stuffing and peas in each puri. Add a little chopped onion in the poori. Add 1/4 tsp each of green chutney and sweet chutney. Add a big spoonful of fresh curd in and on the puri. It is ok if some curd overflows. Sprinkle chopped onion, sev, chaat masala, red chili powder, freshly cut coriander, chopped tomatoes on all the pooris. Dahi poori is ready to eat. Serve immediately. This is how it is served in the restaurants as well as on the street. 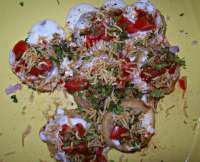 If you are having other chaat items such as pani puri, samosa etc, it is nice to end with a dish of dahi puri. It is a perfect end to your Indian street food meal. Pick up a whole stuffed puri, open your mouth as wide as you can. 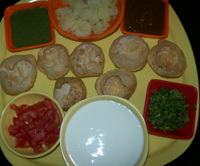 Stuff the poori in your mouth. The cool curd (yogurt) fills your mouth along with the spices and other ingredients. Close your eyes and savor the mixture of tastes.